Human testes are masters of mass production, spitting out sperm at a rate of 200 million per day. But that doesn’t mean the process is fast–it takes 64 days to make a sperm. The organ keeps the count high with an assembly-line anatomy that scales up sperm development from a trickle to a flood. About 300 bundles of seminiferous tubules lurk beneath the fibrous wall of a testis. Each bundle contains one to three tubules, each ranging in length from one to three feet long. The tubules are hollow, with a distinct wall surrounding an open lumen. Most of the sperm development action happens at the wall. The wall of the tubule is made up of two types of cells: spermatogonia and Sertoli cells. Spermatogonia are germ cells: the mother cells that give rise to every sperm. They huddle against the outer edge of the wall, surrounded by the Sertoli cells that nurse them. 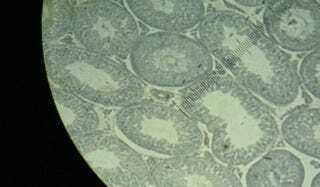 Sertoli cells are also anchored at the outer edge of the wall, but where spermatogonia huddle, Sertoli cells stretch through the tubule wall and stick out into its lumen. When a spermatogonium starts down the road to becoming sperm, it starts dividing and splits up its chromosome pairs, becoming first two spermatocytes and then four spermatids. As it divides, adjacent Sertoli cells surround each set of daughter cells and move them, like a biological conveyor belt, toward the center of the tubule. All the while, the Sertoli cells secrete proteins to nourish the developing sperm and push them toward maturation. The Sertoli cells’ job isn’t done when the spermatids reach the edge of the lumen. As the spermatids mature into sperm, condensing their chromosomes and growing the tails they’ll use to swim, they also jettison most of their cytoplasm and other cell organelles in a quest to become small and speedy. Sertoli cells play housekeeper, absorbing all the goo the spermatids toss off. When you look closely at the inside of a seminiferous tubule, you can see the sperm assembly line in action. Between every pair of Sertoli cells, all along each tubule, developing spermatocytes are stacked from the edge of the wall to the start of the lumen. And millions of spermatids getting ready to move on their own wait at the very end of the line.